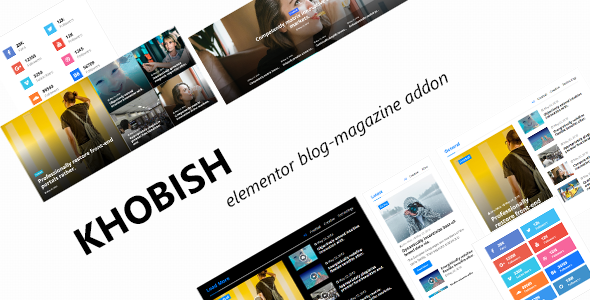 Khobish is blogging/magazine package for Elementor Page Builder. You can easily turn your site into powerful blog/magazine using this addon. Categorised post will load on click using ajax, smoothly. Eack block has previous next and load more pagination. The addon uses velocity js library for smooth transition for loading post. Images will be loaded when content appears thus speeding up loading time. Classy and yet amazing news ticker!. Must have for magazine sites. Helpful widgets including social media follow and tabbed post.